This is the press release for my recently announced sale of audio rights to AudioGO. Alexandra Arlango, Commissioning Editor - Original Content at AudioGO Ltd in London, has acquired world rights to an audio edition of Sam Stone's first collection, Zombies in New York and Other Bloody Jottings. Sam Stone’s first novel, Killing Kiss, won the silver award for Best Horror Novel in ForeWord Magazine’s Book of the Year competition, and her subsequent novels and short stories have gained her much acclaim, including winning the British Fantasy Award. She holds an MA in Creative Writing and is a noted public speaker and lecturer. Sam’s website is at www.sam-stone.com, Telos Publishing is at www.telos.co.uk. AudioGO is the new name for BBC Audiobooks, the UK’s leading audiobook publisher and distributor. AudioGO was formed in July 2010 - its new owners, led by Michael Kuhn, have ambitious and exciting plans for growth and expansion. The company is the UK market leader. It also has a successful, rapidly growing business in the US and a thriving international business. It has a heritage stretching back over 20 years based on BBC Radio content, but has built on that with the acquisitions of Cover to Cover and Chivers, brand leaders in fiction and particularly well known in libraries. The company now has a catalogue of thousands of audiobooks and established relationships with retailers and distributors around the world. AudioGO plans to expand its catalogue, its distribution channels, and to better exploit web and other emerging online retail opportunities. Telos Publishing is a friendly independent press with bags of enthusiasm and a love of publishing and books. Set up in 2000 by David J Howe and Stephen James Walker, they won the 2006 World Fantasy Award in the best Non-Professional category for their publishing work, and several of their titles have won literary and design awards over the years. They specialise in Non-Fiction Guides to cult film and television, and also publish occasional fiction, mainly in the horror and crime genres. Delighted to announce that David J Howe and I will be joining the line-up for the SCI-FI WEEKENDER at Hafan Y Mor Holiday Park, North Wales. The event takes place from 1st-3rd March 2013. 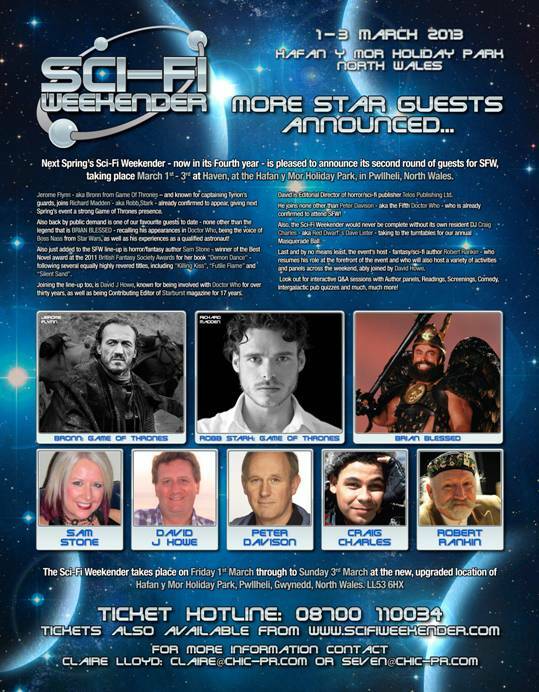 Guest line-up announced so far includes Robert Rankin, Brian Blessed, Craig Charles, Peter Davison, Richard Madden, Jerome Flynn ... and many more to be announced shortly. This is the advert that will be going in SFX Magazine's next edition. Looking forward to it ... It's going to be a very busy year next year. I’m Cardinal Cox and I fully understand if you’ve never heard of me, after all, I’m a poet. I have been published in both Britain and North America, won a couple of prizes and had a couple of residencies. The reason though why Sam kindly asked me to be a guest contributor to her blog is that I’m also a genre poet, writing a lot of verse in the Lovecraftian tradition. (I also write steampunk poetry and I’ve lectured English degree students on SF poetry at my local University centre, but those are subjects for different articles). Again, I’ll understand if you don’t immediately think of poetry when you consider Lovecraftian fiction, but I’ll argue that is essential if you want to fully appreciate the weird fantasy of H.P. Lovecraft and his circle. That is from the poem ‘The City in the Sea’ by Edgar Allan Poe and I contend that it is the major source for Lovecraft’s image of Cthulhu and R’lyeh. Poe was heavily influenced by Byron (going as far as to emulate his hero’s swimming feat) and in turn influenced the French poet Charles Baudelaire and thus the whole decadent movement of the end of the nineteenth century and thence the surrealists of the early twentieth. Just as importantly (in my opinion) is the influence of Poe upon Lovecraft and his circle. Between Poe and Lovecraft though there were other poets in the weird fantast field, for instance both Ambrose Bierce and the Anglo-Irish author Lord Dunsany had volumes of poetry published. H.P. Lovecraft had a large number of poems printed in Weird Tales and it is possible to find collections of his verse. For instance ‘Hallowe’en in a Suburb’ published by Stanza in 2010. Other members of his circle of fellow writers were also active poets including Clark Ashton Smith, Robert E. Howard (both of whom also had volumes from Stanza) and Frank Belknap Long. Subsequent authors in the field who have penned verse include the Brit’s Ramsey Campbell and Brian Lumley. Looking back at my own interest in H.P. Lovecraft I started reading him in the late 1970’s and in the early 1980’s my then band recorded on a demo-cassette somewhere a track called ‘When The Space Gods Come’. Forward to 2003 when I was the Council-appointed Poet Laureate for my home city (Peterborough) a couple of the projects I wrote included a cycle of poems for the local comic-shop (The House on the Borderland, now only trading on-line) and as Poet-in-Residence of a mad Victoriana-convention in Ireland (They Came and Shaved Us, guests included Robert Rankin and David Lloyd). Both of those included overtly Lovecraftian poems. Since 2009 I’ve been writing Lovecraftian verse regularly and produced a handful of pamphlets that have picked-up good reviews in Britain and North America. So there is a small specialist market for these, but don’t discount the more mainstream market if you too write such poetry. Depending on what you write, you can get published in those too (though it’s not easy) if you’re willing to claim the mood pieces are either metaphors or ironically post-modernist. As I said, I’ve had a couple of residencies, including for a local cemetery (the audience wasn’t great, but they never walked out on me, but I did get a piece in the Times Saturday Magazine out of it) for three years and I’m currently a third of the way through a year-long post at a 15th Century Gothic church. In both of these posts, although I seldom have need to discuss in rhyme the gibbering madness that lurks in the outer darkness, I feel my poetry is all the stronger for having an unseen foot (possibly cloven) in the terrible shadows. If you live in Britain, consider sending an SAE for information to either (or both) Data Dump c/o Hilltop Press, 4 Nowell Place, Almondbury, Huddersfield West Yorkshire HD5 8PB and Handshake c/o Dunnock Press, 5 Cross Farm, Station Road North, Fearnhead, Warrington WA2 0QG.